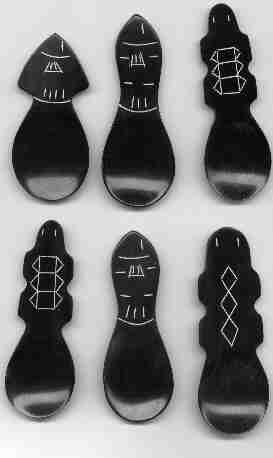 This very unusual set of six spoons appear to be hand carved from a hard blackish material. 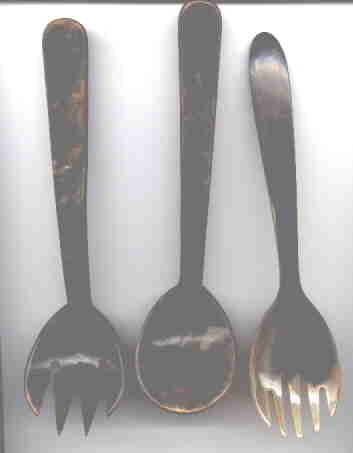 Some parts of the spoons show a grain pattern and other parts are translucent in a manner similar to tortoise shell. I suspect that the spoons are made from some type of horn or shell. There is no indication where these spoons are from. I am guessing that the origin is probably the South Pacific, but I could easily be wrong. The designs are scratched into the material. Apparently the material shows white just below the surface. The material is fairly soft and not difficult to carve. The quality of the workmanship is "tourist", thus I suspect that they were a souvenir spoon set. If you have any information on these pieces, please write me by clicking the mailbox at the bottom of this exhibit. These pieces appear to be made from tortoise shell. I don't know if they are actual tortoise shell or one of the various imitations that are available. If you know how to tell the difference, send me an email. The spoon measures about 8.5" and there are no identification marks.